Which material for a shadow candle? The fabric of an awning must be weather resistant and have colors that are preserved over time. Both technical and aesthetic qualities are expected and can only be guaranteed with materials specially developed for outdoor use. Special treatments of the fabrics bring additional and welcome benefits. Which types of fabrics are available for shadow candles? • Polyethylene candles , microperforated or not, to let the air through. • Acrylic candles , water-repellent. The former are more resistant to wind and avoid the greenhouse effect felt under too tight a fabric, while the latter are waterproof, rainproof and impermeable. Everyone can benefit from treatments that improve both use and longevity. What are the possible treatments for the tissue of shadow candles? For ease of maintenance, many shadowed candles are now treated for stains: a simple sponge passage removes the deposited debris. An awning must also be made of shatterproof material, as it is often exposed to external elements. It must not deteriorate, even if it is stored in a damp building during the winter season. Why use a particular shade for shadow candles? The cloth of a shadow candle is exposed to burning suns, violent winds and pouring rain. Therefore, it must be particularly strong and, above all, strong in order to withstand the risk of tearing. So that your colors do not fade under UV rays, you also need a material and a special treatment. The resistance to sunlight is rated on a scale of 1 to 8. The cotton has a resistance of 4, while the fabrics of our awnings rise to 6 or 7. Therefore, the beautiful red that was selected is not selected. will be pale pink in one season! This resistance to UV rays has an effect not only on color, but also on the quality of the shading: our screens filter 97% of the rays, so you are comfortable even at noon. Therefore, a light candle is filtered to be as effective as a sunscreen. How do I care for the substance of a shadow candle? Awnings are designed to withstand time with minimal maintenance. Once a year, preferably before storing it for the winter season, you can rub it by hand with a brush before lightly using a mixture of water and mild soap or a detergent suitable for cleaning . Rinse with clear water before drying outdoors. From time to time you can also use a waterproof product to restore the water-repellent properties of your fabric. 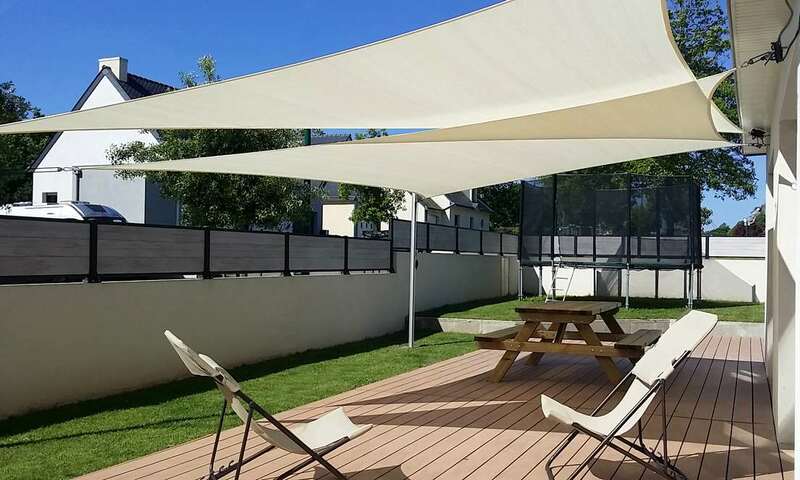 If the inherent properties of the fabric from which an awning is made have a major impact on durability, the surfaces will also play a role in this regard. Choose candles with connecting rings instead of buttonholes as well as those with reinforcing band. Finally, think of the grammage: Below 200 g / m², the awning is much more fragile (our sails have a weight between 220 and 340 g / m²). Also read: Which color do you choose for an awning?